Osoyoos, BC, Canada was originally called ‘Souyoos’ which translates as “the narrow waterway where the land almost meets” and is the southern most town of the Okanagan Valley, just 2 km (1.2 mi) north of the US border. Excavations in Osoyoos show that the aboriginal people have lived here for thousands of years, harvesting the resources of the land. This was a hard working culture that sustained the Okanagan people for thousands of years. From that has come a very progressive and successful band under today’s leadership of Chief Clarence Louie. Chief Clarence Louie and Virgil Smoker Marchand have designed and produced several pieces of art over the years that are scattered about the Okanagan Valley. Smoker Marchand was first commissioned by Chief Louie to create the metal sculpture to honor history of the natives. The Unity Rider carries the nine feathers that represent the nine known Indian bands of the 1880’s. The Unity symbolism originated as part of the modern North American Aboriginal Unity Ride ceremony. The entrance to the NK’Mip RV park has a story to tell with the sculpture of the native fishing for his food. It is a welcome to the park and a tribute to the forefathers of the Osoyoos band. The Chief greets all those who visit the NK’Mip Desert Cultural Center with his peace pipe offering in hand. This was another piece of artwork by Smoker Marchand commissioned by Chief Louis. The Cultural Center has several pieces of Marchand’s work on display on their nature walk but due to the time of year for my visit, the Center was closed, I will return next year to enjoy more of this incredible work. The NK’Mip Resort, pronounced ink-a-meep and meaning bottomland, offers this work of art as you drive through the Spirit Ridge Vineyard Resort & Spa. Other sculptures are displayed throughout the area that I hope to see before I leave this area. ﻿﻿The most recent of the artwork that I have seen are these two figures at the entrance of a new development north of Oliver. The Senkulmen Enterprise Park is still at early stages with many plans to follow and this entrance display has now been completed. I find these pieces of art absolutely fascinating and hope to find more. The works of Smoker Marchand along with the design of Chief Clarence Louie make a very impressive combination and unique to the area. If you wish to learn more about the Chief and the Osoyoos Indian Band and its development corporation, clik here and you will learn more on their impressive business growth over the years. ﻿Gold was once a part of the growth of the Okanagan valley before it came to be known as it is today. Although it was first discovered in 1869, it took almost 20 years before the first gold mining claims were registered in 1887 on both sides of the valley above what is now called Oliver. 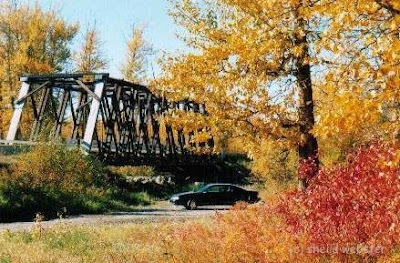 By the turn of the century, Fairview was one of BC’s largest towns with a population of 600 and was located on the west side of the valley. 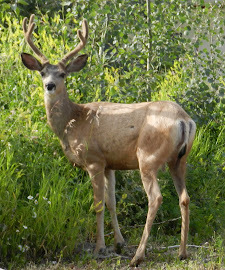 The area once known as Fairview is now an ecological preserve with a walking trail to see signs of the old town sight. You’re invited to enjoy the tour but do not dig on the site or remove any artifacts. Oliver, BC later began as the office location for the South Okanagan Lands Project. The agriculture industry in the area was in jeopardy until Premier Oliver created the Soldier’s Land Act. This would become a rehabilitation project for veterans returning from World War 1 who would be needing work. The returning world war veterans built the ‘Ditch’, which was a gravity run irrigation system engineered and built between 1919 and 1927. In all it stetched 40 km (25 mi) with combined construction of concrete-lined ditch and metal flumes on wooden trestles and much of it remains today. The engineers camp was built for the crews on the sight of today’s Oliver Community Park, just across from the RV park shown here and where the townsight named after Premier Oliver was eventually built. The Okanagan River looks more like a canal in many parts of the Okanagan. The Haynes Ranch buildings date back to 1860 when the house was built for Judge John Carmichael Haynes. It addition was added in 1875 and was lived in until 1963. The bunkhouse to the side of the main house was built for the son in 1911 then used for work crews. The barn, also part of the Haynes Building Preservation Project, was built in 1906 but burned down in 1914 then later rebuilt in 1916. The attic is now home to long-eared bats but the fenced area around the barn is still being used for cattle as descendants of the Haynes family still herd cattle. Cattle barons once raised large herds of cattle that grazed the bunchgrass-rich landscape, but there is now little sign of that in the Oliver area of the southern Okanagan. These horses enjoy the pastures today with the beautiful mountains beyond the valley as their background. ﻿Oliver, BC is our RV’ing home base for work for a few months which also makes for an easy drive to several beautiful locations in the Okanagan Valley of southern B.C. for the play part of RVing. There are several places within less than an hour drive that will thrill the senses and offer many photo opportunites, which I admit I try to fulfill as often as I can. Oliver is located about 40 km. north of the US border and has a population of about 4500 people. It has earned the title of the Wine capital of Canada because it now produces 10% of the nations wine, including many of its finest vintages. ﻿ Glacial deposits formed the west bench during the ice age. The west side of the valley seen in the distance across the valley is called the Golden Mile. The deep sandy deposits on the east bench, which is where this photo was taken from, is Black Sage. This combination provides an award winning wine industry. There are 27 different wineries that include 100 vineyards along Highway 97 and the backroads passing through Oliver that make up 53% of BC’s vineyard acreage. A number of wineries open their doors for complimentary tours of their facility. It makes for a great day tour, whether you take a self guided tour or sign up with a wine tour company that will drive you around as well as share their knowledge of the wine industry. The temperature for ice wine grapes must reach -10C (14F) before the grapes can be picked and I am told that it will usually happen at night when workers are called out. They gather to circle their vehicles around the chosen vines to shine their headlights and the grapes can then be harvested. These fermenting stainless steel vats were being cleaned during my recent visit to the winery to purchase gifts for those special wine drinkers. I purchased ice wines, which are a type of dessert wine produced from grapes that have been frozen while still on the vine. I was standing at the side of the quiet road taking pictures of these beautiful acres of vines when I almost hit the ground to take cover from what sounded like a gunshot blast. I knew I wasn’t trespassing but it sure did make me nervous until I figured out what was happening. While you get that chuckle under control, I will explain further. Birds can be a serious problem in the vineyards. They can destroy the crops and steps must be taken to prevent that from happening. Some vines are wrapped in order to prevent the birds from getting to the grape, shown in the picture of the grapes and another method used is the propane exploder. I found the culprit and took this picture. There are several festivals and events in the South Okanagan but one of the very favorites is the Festival of the Grape in Oliver. The 14th annual festival was recently held and the crowds were there to enjoy the festivities that include activities for the kids, as well. There were over 50 wineries gathered onsite, vendors with handcrafted clothing, wine & kitchen accessories, gourmet food items, an art show and sale, games, live entertainment and a grape stomp which may well be worth the price of admission alone. The Okanagan Valley has so much more than vineyards to offer and I am anxious to bring more to show you. Watch for the incredible autumn colors of their orchards in following pages. St. Andrews by-the-Sea sounds like it should be a wonderful little town and that is exactly what it is. We drove 100 km (62 mi) west of Saint John, NB to spend some time at this very picturesque hamlet on the Passamaquoddy Bay. The main town of St. Andrews has been designated a National Historic District and many of the more than 250 homes that are 100 to 200 plus years old have been restored. Storefronts also have the historic look, the styles have not changed over the years. St. Andrews was first settled by United Empire Loyalists in 1783 following the American Revolution. Some of their homes that were brought here from Maine and reassembled are still standing today. St. Andrews by-the-Sea’s natural beauty helped it to become the first seaside resort town in Canada which attracted many of the wealthy families from the East. Some of their cottages built in that day are considered mansions by today’s standards. This quaint seaside town overlooks the Fundy Isles, considered gatekeepers to the Bay of Fundy. What an incredible sight this viewpoint can enjoy, no matter what the weather is. The tide was out for our visit so no toes in the Bay of Fundy here but we enjoyed the view ….what a beautiful place to spend your quiet time and savor it all. Breathe deeply, can you smell that ocean? St. Andrews was found to be one of the most intriguing destinations in the world by the National History Magazine. We were fortunate to spend some time at a friend’s cottage and to enjoy the quiet tranquility of St. Andrews. We shopped for some lobster at a local seafood shop and enjoyed our very first Maritime lobster dinner, what more could we ask for? There are so many opportunities to enjoy St. Andrews whether you’re walking or biking nature trails, shopping, boating, fishing or getting into the history of the town. There are museums, gardens and islands to see. Whales, bald eagles, and other wildlife enjoy this beautiful location and allow us to enjoy watching them. No matter what your interests may be, I am sure you will enjoy St. Andrews. It is a little gem on the Bay of Fundy that shares its’ picturesque charm with all who visit. We were there in the fall so there were no crowds but autumn colors were coming. Be sure to put St. Andrews on your list when visiting New Brunswick in the Maritimes. For those of us who live where we have four seasons, we likely have favorites for a variety of reasons. There is most definitely something beautiful about snow covered mountains, spring blossoms brightening our yards up after winter, warm summer days at the lake but then we have autumn. Autumn is one the most beautiful seasons with the colors of the changing leaves. 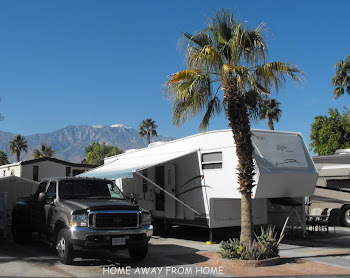 It varies from one area to another depending on the kind of trees there are and we have seen that difference during our RVing travels. Do you wonder how this beauty happen? I put this answer at the bottom of the page. Road in this area. The road follows Coyoosh Creek for parts of the trip and it was near Lillooet that we saw this beautiful scene. Click here for more pictures of this area. Our view as we drive over the Coquihalla Highway #5 is mainly mountains covered in coniferous forests which can consist of spruce, pine and fir trees. Coniferous means ‘coming from the cone’ and they don’t shed their needles over the winter. But there are sprinkles of deciduous trees amidst those and they have a chance to show their glory when fall arrives. I believe one of the most spectacular sights that I happened to see was on Highway 29, the drive between Hudson Hope and Fort St. John, BC as it follows the Peace River. I was not expecting to see so much color, it was gorgeous on that sunny day. I had to make a second trip to see it all again, it was so beautiful. 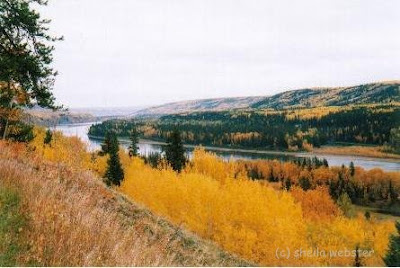 Some of the most common deciduous trees, which shed their leaves annually, are birch, aspen and cottonwood trees and these are among the trees that follow the Peace River, one of Canada’s longest river systems. I took a zillion pictures and that was before digital! It was a painful wait to get all those film developed but it was worth it. Although pictures didn’t do justice to the sights I was seeing, they did come close. There was more to see from the viewpoint at Fort St. John, clik here for more. On a drive through the Okanagan Valley on Highway 97 in BC, we stopped to take a picture of the colors as we look across to Oyama, BC. It is known for serenity and sunshine and displays that with wonderful colors on this day, nestled between Wood Lake and Kalamalka Lake. Our Cross Canada trip of 2009 was planned so that we could see the autumn colors back east. This had been a very important part of the planning because of the maple trees and their red leaves, which we don’t see in our neighborhoods. The time of fall colors is a short one, there are only two weeks between beginning and end of those colors, so this should happen while we are in eastern Canada. Timing is crucial and we were on the hunt for the maple trees whose leaves turn red due to the glucose in them. We would have seen more had we been in Ontario and Quebec for that time but as it was we found some beautiful colors in the Maritimes before we left there. Autumn leaves were showing up as we made our way south. We were following major highways and the opportunity to take pictures wasn’t easy but we did have some on our stay at this RV park in Maine. 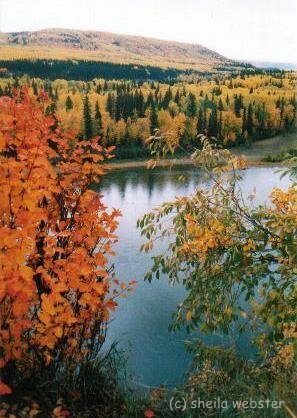 We love rv’ing and enjoy all the sights on our travels, but there is no doubt that autumn is a very pretty season all over this beautiful country of ours. Deciduous trees, which is from a latin word meaning ‘to fall’, show green leaves during the growing season but when the season ends, they will show yellows and oranges which are actually always there but only appear as the green fades. This happens when the days shorten into the autumn season. It is caused by an altered sun position, a lack of water, which is a major contributing factor plus other more scientific reason I won’t detail here :). We love rv’ing and the opportunities that it gives us to see this incredible country of ours but no matter how much time we have, we just cannot see all that we’d like to see. So with that in mind, our visit to Halifax, NS was far too brief but we decided that the time we had to be there would be spent on the Halifax Harbor Boardwalk. The boardwalk, said to be the world’s longest, winds through parks and open air plazas past several piers with boats and ships of all sizes. We were there on a sunny autumn day, perfect for wandering along the boardwalk and many piers to enjoy the shopping, restaurants and historic buildings. George’s Island can be seen in the harbor with the lighthouse standing as it has for many years. This island played a key role in the harbor’s defense system for almost 200 years. It isn’t open for the public now but has been named a National Historic Site and the federal heritage department is restoring it, so it will hopefully be available for viewing in the future. The boardwalk is a big attraction for pedestrian as well as marine traffic, the downtown waterfront is on the world’s second largest natural harbor. It was exciting to see the variety of ships in that harbor. There were tall ships, small ships, sailboats, working boats and pleasure boats, there were all kinds of boats ! Halifax hosted the Tall Ship Festival 2009 which saw 40 vessels arrive from 13 countries. That would have been a wonderful sight to see. The Tall Ship Silva is a permanent resident at the harbor and offers harbor tours and private charters. The music carried across the water and sounded like a great time was being had by all. The HMCS Sackville is the last survivor of the 269 corvettes that fought the Battle of the Atlantic in 1935-1945. This ship, preserved as Canada’s Naval Memorial, is berthed at the pier and open to the public all summer. It is then returned to the naval dockyard for it’s annual maintenance. There are many opportunities to see the harbor from a ship, boat or ferry. The pirate ship seen here offers tours and that includes the shooting of the cannons, which adds to the fun of the experience. I am sure there were real pirate ships in the harbor’s history when you realize that this was Canada’s first British town in 1749. The Maritime Museum of the Atlantic is on the boardwalk and is the oldest and largest marine museum in Canada, celebrating their 62 anniversary this year. It is the place to visit if you wish to learn more and immerse yourself in the rich maritime history of Nova Scotia. Clik here for more information on this beautiful museum. We did make a short stop at the Halifax Public Garden which is a Victorian garden with many typical Victorian features. Officially opened in 1867, it is open every day 8am to dusk from Spring to the Fall. The Friends of the Public Gardens was formed to help preserve and protect this unique National treasure and to read more about that, clik here. As a very true Victorian garden, there are several statues in the gardens and no Victorian garden should be without a gazebo. This beautiful one stands near the center of the garden and has seen many wedding parties gathered here over the years. We saw two wedding parties taking pictures during our visit there. Halifax is steeped with wonderful Maritime history including the Halifax Citadel which is a National Historic Park. There are tours for the park and city available that will take you back in time, that tell stories that have made this city what it has become over the past hundreds of years.